The poem in the Exploring section of this session comes from a collection of stories and poems written at a creative writing workshop run by Ged Neary for the Manchester Carers Centre. The sixteen contributors, all carers at the time of writing (January/February 2008), offer 30 different responses to the experience. 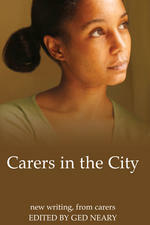 Manchester Carers Centre is one of many local centres offering support for carers. The Princess Royal Trust runs 144 of them and you can find your nearest here. All offer information and support and many offer other services also. Manchester is a great City for more ways than one. It is also proud to boast the many care centres which you can find in and around the Manchester city centre.